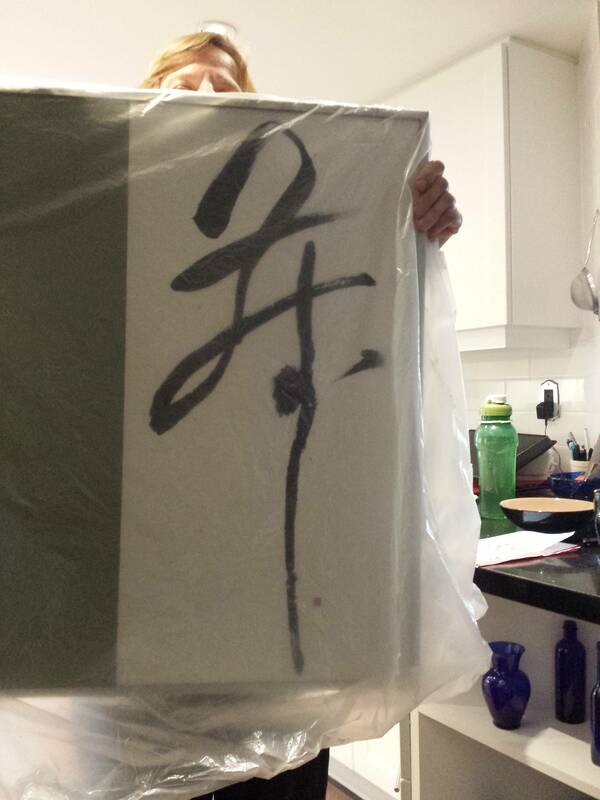 Any Chinese calligraphy experts out there? I guess I don't actually know that it's Chinese, but after snooping around the internet a bunch it looks most like the semi-cursive Chinese script to me. My mother's friend's roommate's father recently died and they found this wall hanging of his but they don't know what the character means (half the hanging holds the character, the other half is blank green). Internet sleuthing has not solved the question. My own best guess is that it means "home". I (or rather my mother) think that it is the 舞 (dance) character. If you search for "草书 舞" (cursive script dance) you can see that the results are similar. Seems close, but where does that dot on the right side come from then? She's definitely right. 草书 is a style of cursive calligraphy where the characters are hard to distinguish from the original word if one is only used to the standard writing. I fall into that category and have problems recognising cursive writing of characters that I haven't seen before. especially without the aid of context (which is usually available). However, upon looking it up on google, I am sure that his mom is right. Just don't worry about the dot, it's just some artistic license. Moreover, if you were to see the other pictures, you'll see several examples, some of which are a lot closer to standard writing, with an extra dot on the right. Personally, I prefer a lower level of "cursiveness" such as the one below, which I think is a more beautifully written and tastefully curisve 舞 (note the extra dot). The artist went way overboard for my taste on your "舞" and several other similar ones in that google image search. Thanks for the replies, guys. I think I'm pretty much settled that Zigg's mother is right, it's definitely the best answer I've seen yet.